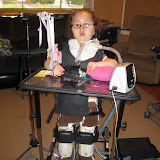 Ally is almost 5 years old and has Type 1 SMA. This is the first time we tried a sling system with Ally in a long time. We are using a microphone stand and two slings to remove gravity for more movement. She is also using a sock with a hole to help her hold the crayon/marker. She can barely move her arms and hands at all on her own, so this is VERY amazing for her. Be sure to click through each picture and you will see that some are short videos of her moving, using a slic crayon and then a marker. She was in her stander for an hour playing around.